On April 14, 2011 VMA 214 Black Sheep hosted a historic squadron reunion at MCAS Yuma. The reunion was attended by three of the five remaining original Black Sheep Squadron members (Ed Harper, Jim Hill, and Harry Johnson). 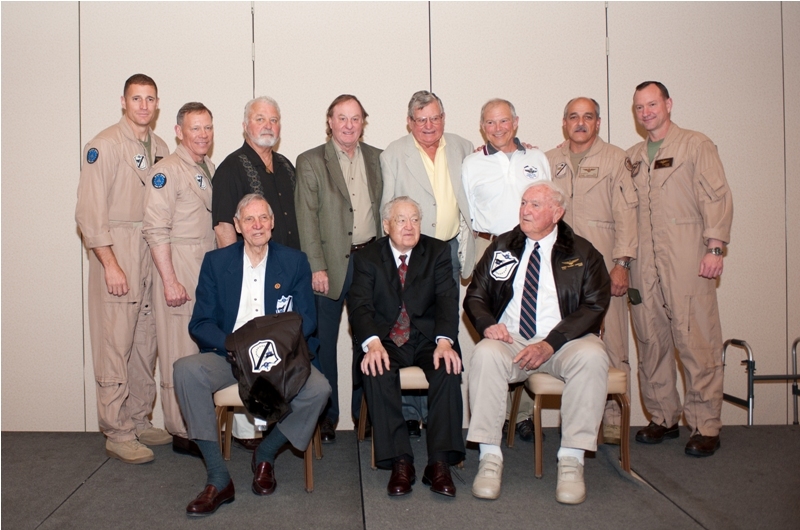 In addition to these legendary figures, other past and present squadron members, and other VIPs attended the event. Several books have been written about this famous squadron, its pilots, and it’s Commanding Officer Major Boyington. A short history of the Black Sheep Squadron includes its re-establishment in August of 1943 by Marine Corps Major Gregory “Pappy” Boyington due to a lack of USMC fighter squadrons in the Pacific. Contrary to popular belief and the theme in the 1970s TV show Baa Baa Black Sheep, the members that originally formed the squadron were not trouble makers, drunks, misfits, screwballs or officers about to be court martialed, and/or absent without leave (AWOL). 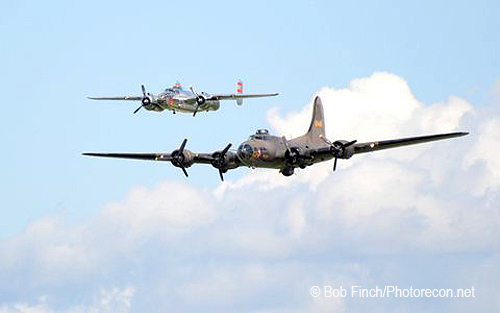 They just happened to be unassigned pilots/replacements awaiting assignments to a squadron. The squadron flew the new Vought F4U Corsair; although this wasn’t the first aircraft type they flew. This was the first time a Marine Corps unit received new planes and not navy “hand me downs.” At the time, the Navy was struggling with getting the Corsair carrier qualified and subsequently gave their new Corsairs to the USMC. VMF 214 flew 1,776 combat missions in the Pacific and generated nine aces. Although the genesis of VMF 214 is historic and generated some legendary Marine Corps aviators, the Black Sheep did not stop making history or producing world class combat aviators when World War II ended. 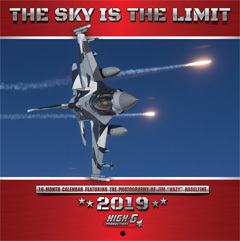 They were the first Marine Corps squadron to see combat in Korea, to be “special weapons” qualified, receive several outstanding safety record awards, and operate the AV-8B Night Attack Harrier. 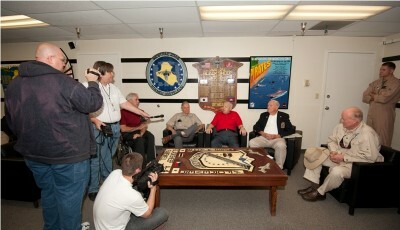 Original VMF 214 Black Sheep members (left to right) Jim Hill, Ed Harper, and Harry Johnson answer questions from journalist. What made the aviators of the Black Sheep unique? 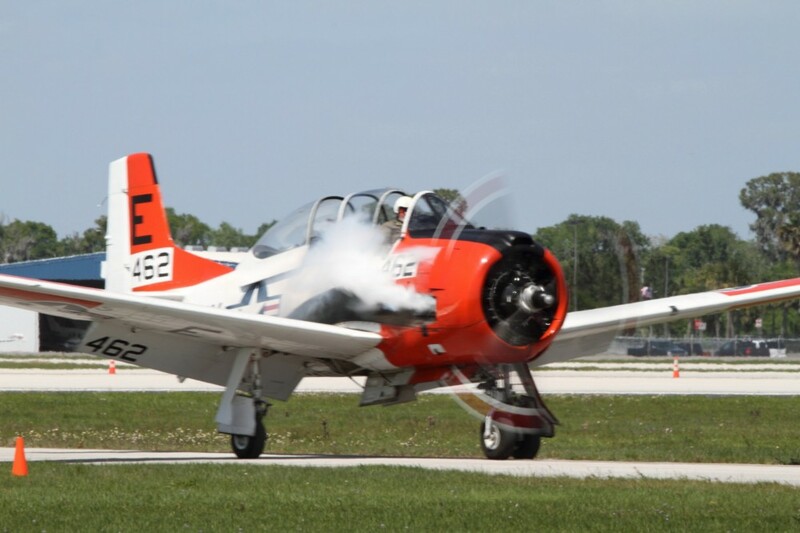 What was Pappy Boyington like? What do you think of today’s Marine? How does it feel to be together with your fellow Black Sheep? 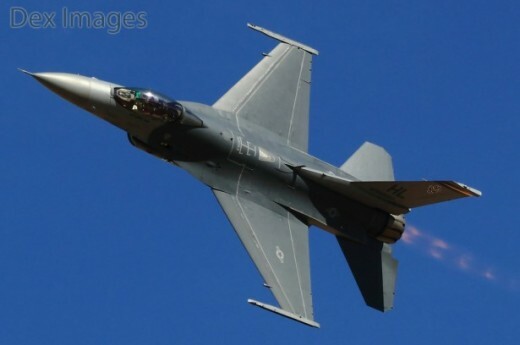 What was it like to be in your first dogfight? Ed Harper talking about what made the Black Sheep unique. 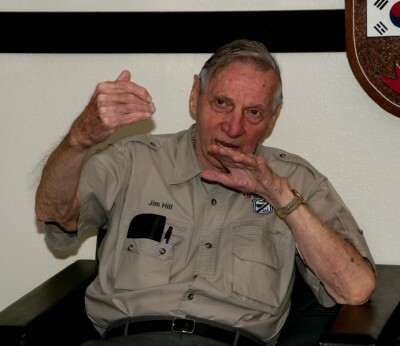 Jim Hill talks (as most fighter pilots do – with his hands) about a dogfight. After an incredible hour with some of the plank owners of VMF 214, we walked down to the Black Sheep hanger for a squadron hosted BBQ. 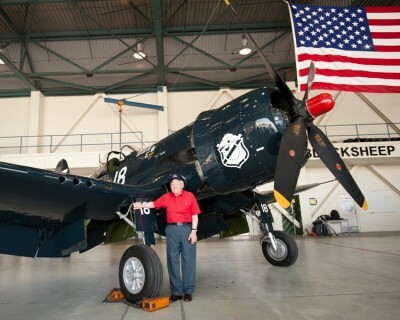 In the hanger was a vintage F4U Corsair (from the Friedkin Family of Texas – The Comanche Fighters) painted in WWII VMF 214 colors and an AV-8B Harrier. The Harrier was VMA 214s Commanding Officer’s (Lt Col Schroder) aircraft with “Major Gregory Pappy Boyington” painted on the left canopy rail. 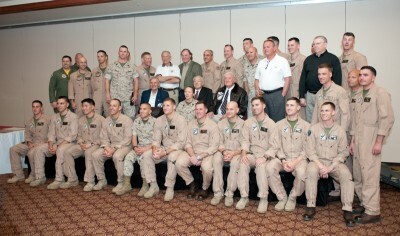 Reunion attendees included family, friends, and past and present members of VMF/VMA 214. 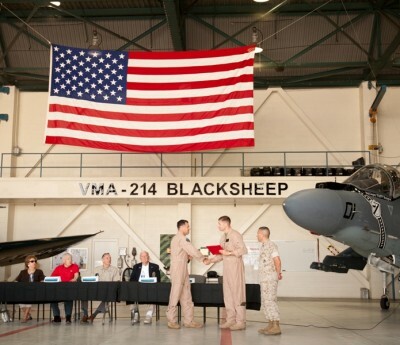 They were first treated to an aerial demonstration of an AV-8B from the Black Sheep. 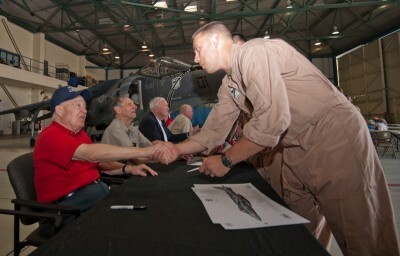 After the demonstration, Lt Col Schroder welcomed everyone to the reunion and then lunch was served. Lunch included BBQ pulled pork and all the trimmings. The BBQ was provided by Del King of “BBQ for our troops.” The purpose of BBQ for our troops is to show their support for the men and women of our Armed Forces by donating world class BBQ meals. BBQ for our troops is a non-profit organization ). 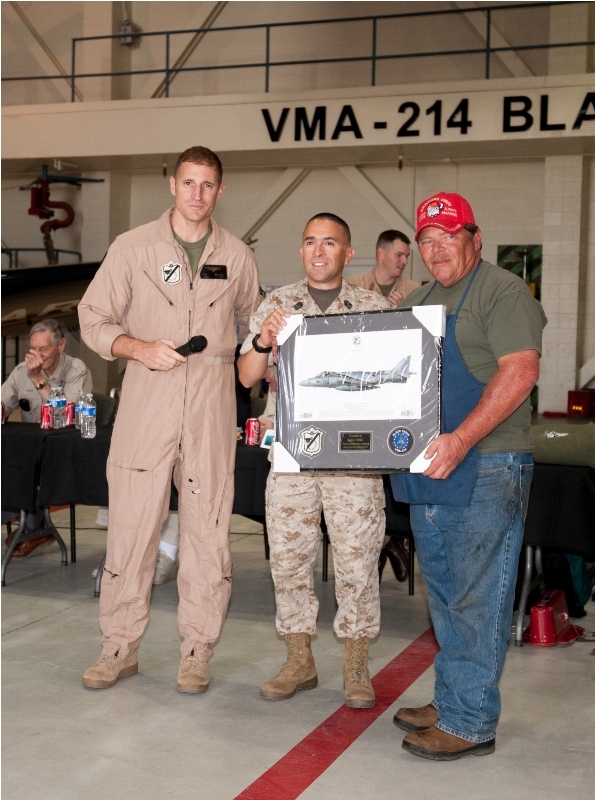 Lt Col Schroder and Sgt Maj Maldonado present “BBQ for the Troops” Del King with a Harrier illustration in appreciation for the organizations support. After lunch, Lt Col Schroder returned center stage. First, he introduced Col Anton Nerad, the Commanding Officer of Marine Air Group 13. Col Nerad welcomed everyone and then presented Lt Col Schroder and Sgt Maj Maldonado on behalf of VMA 214 with a 20,000 Hour Mishap Free Award. Lt Col Schroder thanked his troops for their hard work and efforts. He added that it was due to the squadron’s hard work and efforts that lead to the squadron receiving this award. 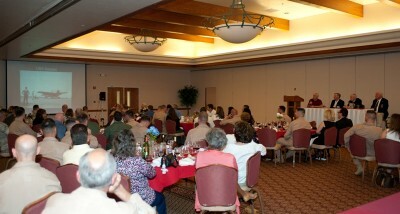 Col Nerad (MAG 13 Commanding Officer) speaks with reunion guests. Col Nerad presents Lt Col Schroder and Sgt Maj Maldonado with a 20,000 Hour Mishap Free Award. 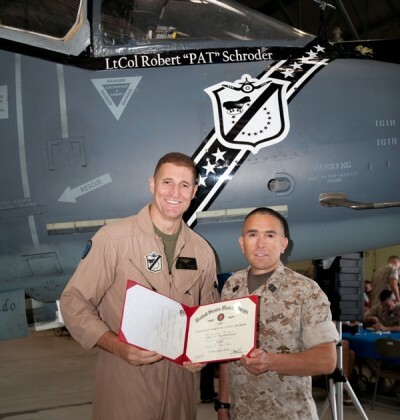 Lt Col Schroder and Sgt Maj Maldonado pose in front of Lt Col Schroder’s aircraft with their squadron’s 20,000 Hour Mishap Free Award. Lt Col Schroder then took a few minutes and talked about the squadron’s incredible history and Pappy Boyington. He explained that before his death in January 1988, Boyington donated his Medal of Honor watch to the squadron. This watch is now worn by the commanding officer on special occasions, such as the reunion today. 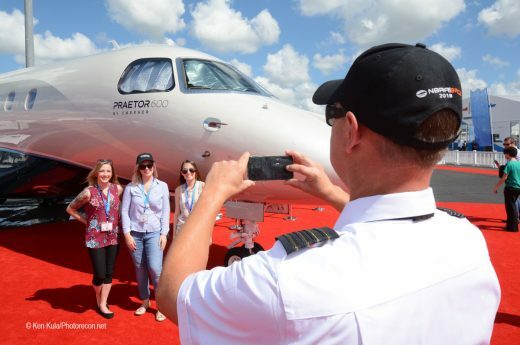 Once the presentations had concluded, the hanger bay turned into a huge meet and greet. Squadron mates that hadn’t seen each other in many years told old stories, Black Sheep Marines’ family and friends enjoying time together, and everyone having an opportunity to meet the original VMF 214 members. Everyone thoroughly enjoyed spending time with these legendary Marine Corps aviators. 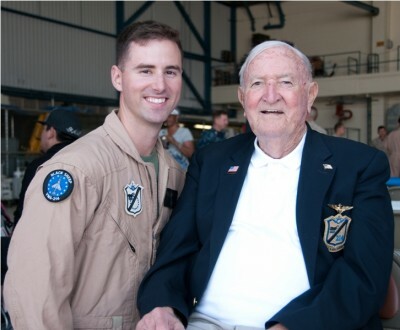 Current VMA 214 squadron member Capt Windt poses with VMF 214 plank owner Harry Johnson. 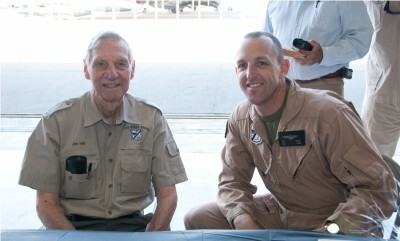 VMA 214 Executive Officer Maj Moore and Jim Hill. VMA 214 Capt Caribardi thanks Ed Harper for autographing a AV-6B Harrier print. 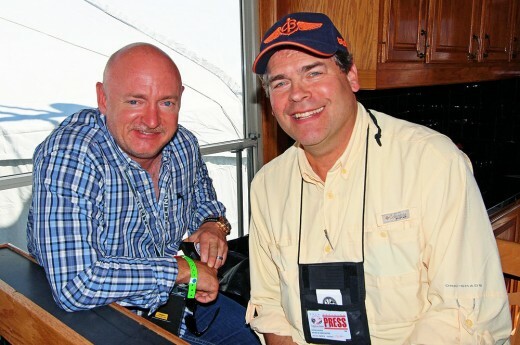 As mentioned early, Bruce Gamble author of “The Black Sheep” attended the reunion. 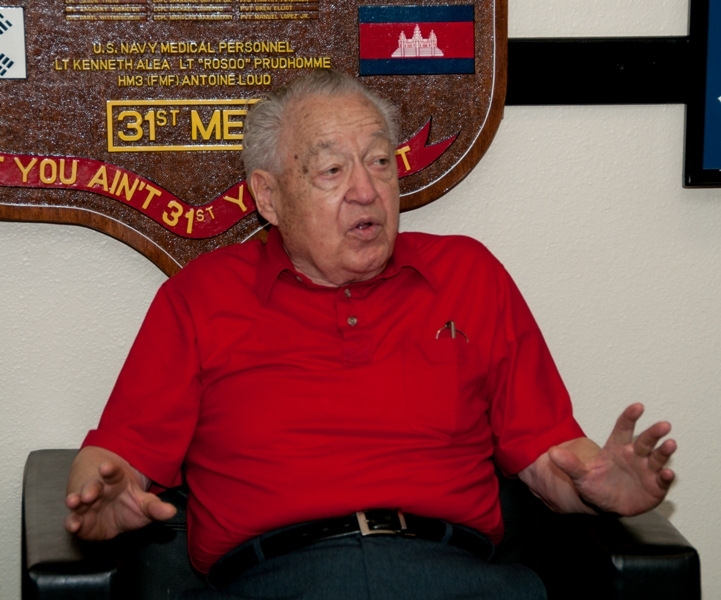 I had the opportunity to speak with Bruce and found him an incredible source of information on VMF 214 and the Pacific campaign of World War II. 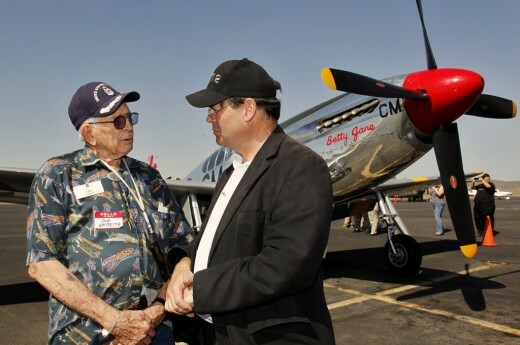 In addition to the book on VMF 214, he has authored a book on Pappy Boyington and is currently working on a book about Rabul during World War II. 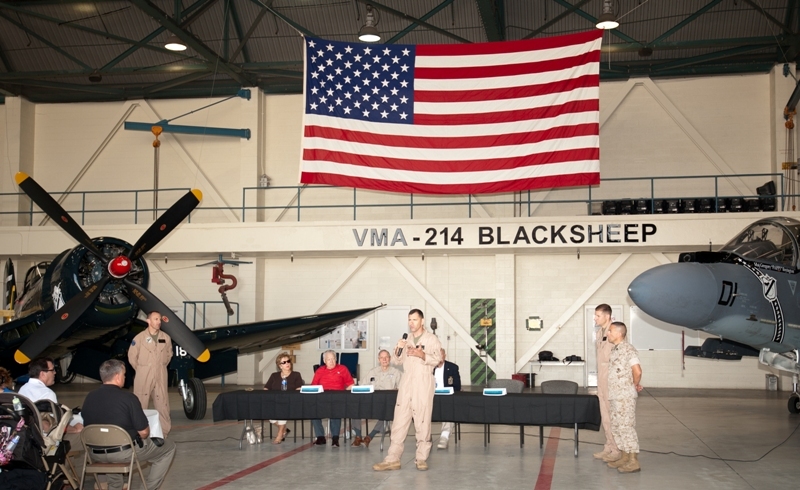 As I walked around the hanger, I had the good fortune to meet and talk with many great Marine Corps aviators who had a connection to VMA 214. One of these Marine Corps aviators was retired Col Tom “Groucho” Carstens. Col Carstens was the Commanding Officer VMA 214 from 1987 -1989. 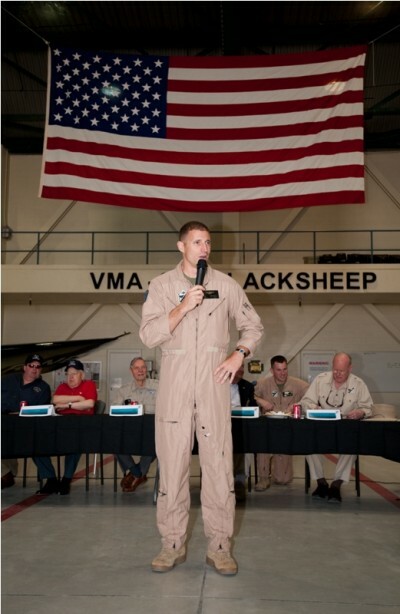 Carstens reported to VMA 214 as his first fleet squadron after flight school. Groucho had the unique experience of being the first Black Sheep, who received his flight training by the United States Air Force, to land on a carrier. 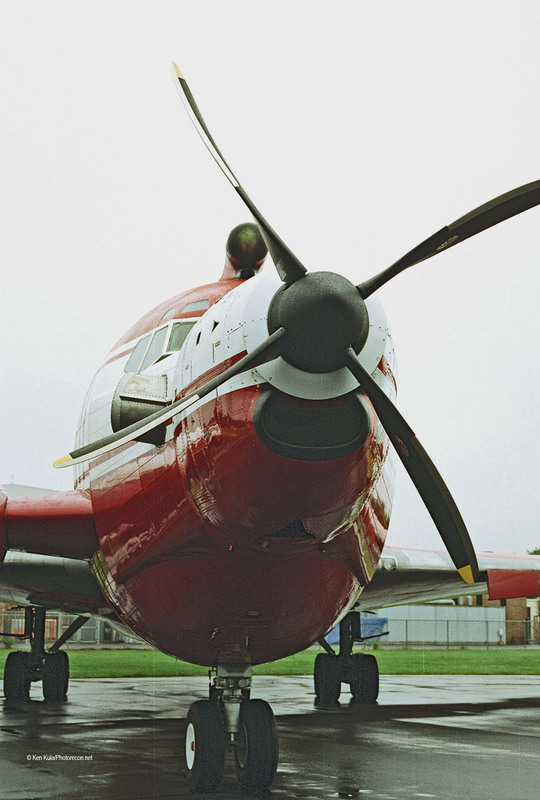 During the Vietnam War, Naval Flight School was overbooked and their overflow student aviators were sent to the USAF. 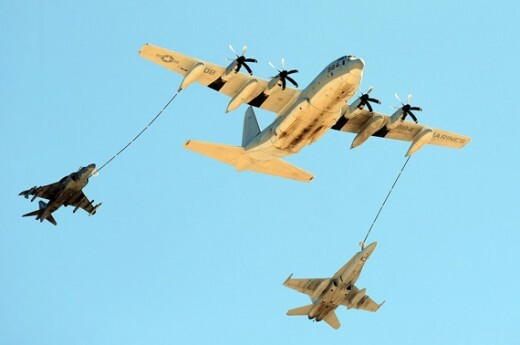 Air Force flight school has produced its fair share of world class combat pilots and aces, but lacked one thing Naval Flight School provides – carrier landings! 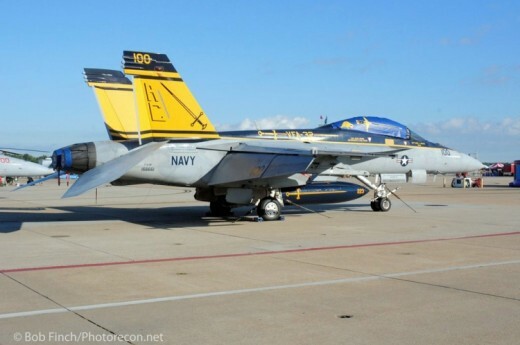 Tom didn’t make his first carrier landing until months after he reported to VMA 214 as a nugget pilot. In October/November 1971 his Commanding Officer Lt Col JJ McCarthy took the Black Sheep off the coast of California to the USS Hancock for carrier trials. It was during this deployment Groucho became part of VMA 214 history becoming the first USAF trained squadron member to trap on a carrier. Fast forward almost sixteen years and then Lt Col Carstens was now the Commanding Officer of VMA 214. He would be the last A-4 Skyhawk Blacksheep skipper. Groucho retired from the United States Marine Corps as a full Colonel in January 1999. 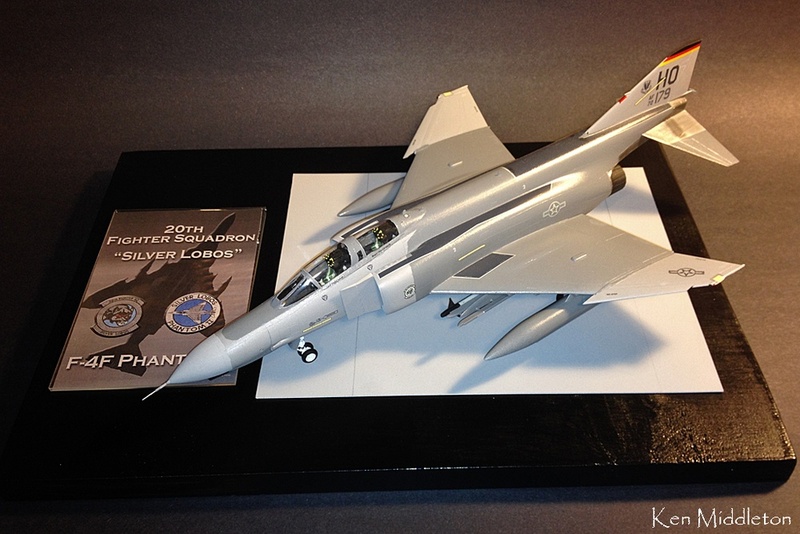 As an interesting bit of VMA 214 trivia, there is a widely known aviation illustration of a trio of A-4 Skyhawks title “Triple Threat” by artist John Doughty, Jr. 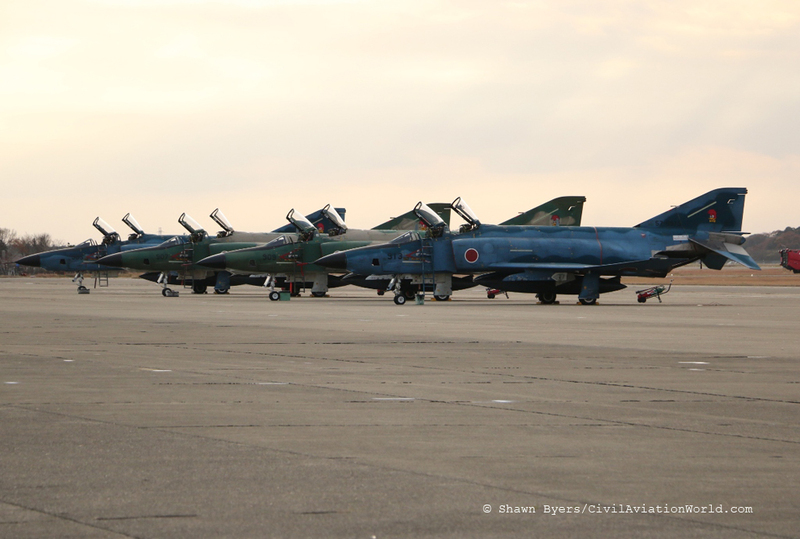 If you look closely at the center Skyhawk, you will notice that it is Lt Col Tom “Groucho” Carstens name on the aircraft. After speaking with Tom Carstens, I met with another past Commanding Officer of VMA 214, Col Russ Stromberg. Coincidentally, Col Carstens turned over command of VMA 214 to Col Russ Stromberg in July 1989. Stromberg would be the first Commanding Officer of VMA 214 to fly the Harrier. I asked Col Stromberg how he would compare the flying characteristics of the Harrier to the Skyhawk. Russ simply said the Harrier was “very stable” and the “funnest” aircraft he had been able to fly. Col Stromberg served as the Commanding Officer of the Black Sheep from July 1989 through August 1990. The reunion ended with a squadron banquet at the MCAS Yuma Officers’ Club. The banquet began with some opening words by Col Nerad. Next, Bruce Gamble presented a history of VMF 214 during World War II. This was followed up with an audience question and answer period from Jim Hill, Ed Harper, and Harry Johnson. Col Stromberg ended the presentation with some comments on Ed Harper. The reunion banquet question and answer period with (left to right) author Bruce Gamble and Black Sheep legends Hill, Harper, and Johnson. Col Harper was the project manager for the A-4 Skyhawk and for an aircraft that would be as revolutionary as the MV-22 Osprey is today. That aircraft would be the AV-8 Harrier. 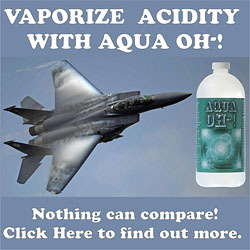 Col Harper was instrumental in the actual purchase of the unconventional “Vertical Take Off and Landing” (VTOL) aircraft. As Col Stromberg phrased it “Ed Harper took the Harrier from a white sheet of paper to rubber on the ramp.” Other than avionics upgrades and the Lightening Pod, Ed Harper’s “hands” are all over the Harrier. Col Ed Harper – Not only an original member of VMF 214, but the godfather of the Marine Corps attack community! 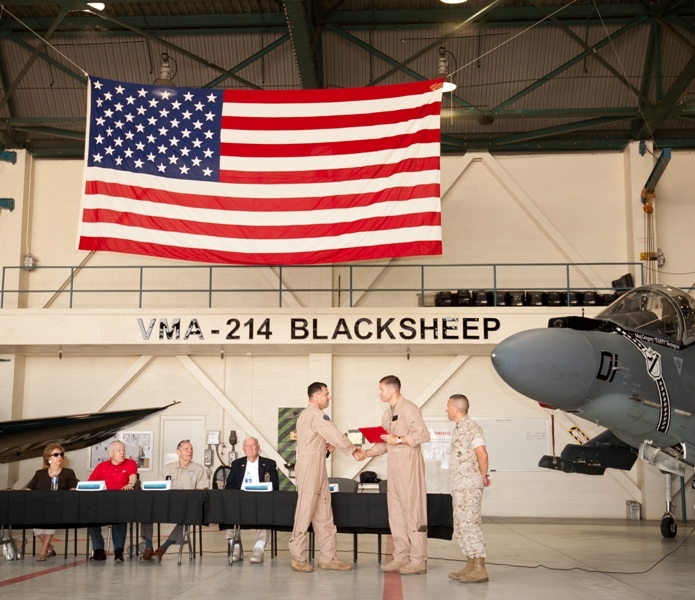 For more than 67 years, VMF/VMA 214 has been at the forefront of Marine Corps aviation and is not expected to slow down any time soon. 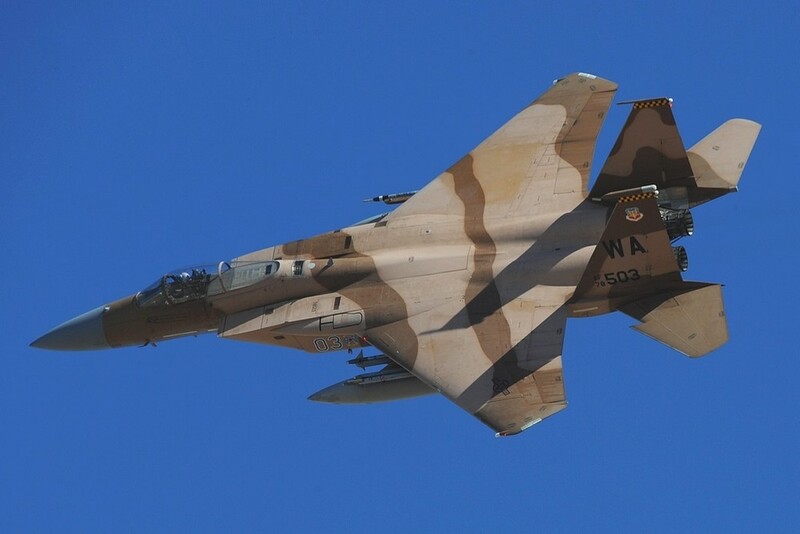 With the Joint Strike Fighter coming online by the middle of this decade, VMA 214 will take night attack to the next level, much like they did in the late 1980s with the AV-8. 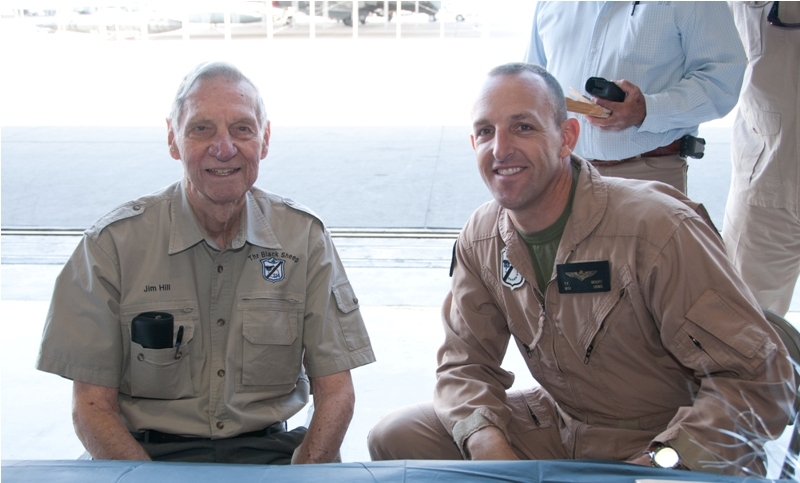 It is hard to express what an incredible experience it was to talk with legendary Black Sheep squadron members Ed Harper, Jim Hill, and Harry Johnson one-on- one, hear their stories of flying combat missions in the Pacific, and to shake their hands! Needless to say, it was an honor and privilege to have the opportunity meet these Black Sheep Squadron plank holders in what some have said would be their last reunion. Commanding Officers of VMA 214 (top row from left to right) Lt Col Schroder (present), Col. Stromberg (89-90), Lt Col Wyrick (79-80), Lt Col Jewell (83-85), Lt Col Smith (69-70), Col Carstens (87-89), Santa Croce (early to mid 2000s), and Claypull (early to mid 2000s). Bottom row (left to right) Jim Hill, Ed Harper, and Harry Johnson. A special thanks to MCAS Yuma Public Affairs Gunnery Sergeant Lisbon and Lance Corporal Diamant for a great job accommodating me and the other members of the media at this event and an additional thanks to Sergeant Major Maldonado for allowing Photorecon to attend the reunion banquet and ceremony.